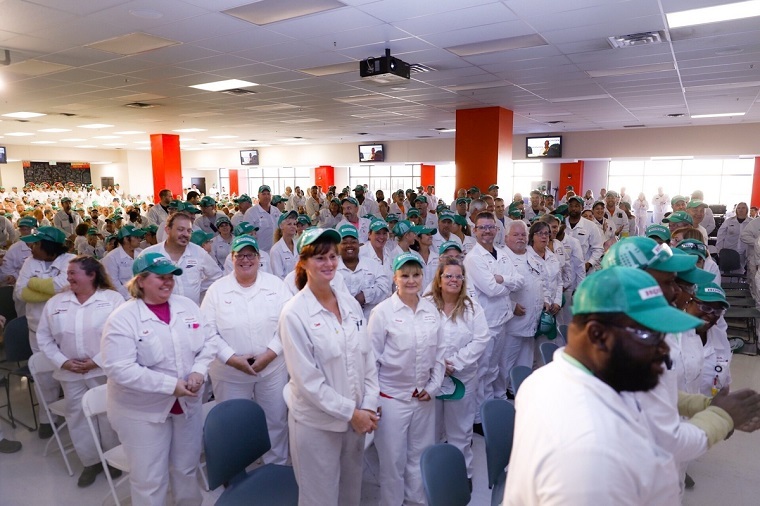 On Tuesday, October 9, associates and state and local government officials at Honda’s manufacturing plant in Indiana, Greensburg, celebrated 10 years of automobile production. The first vehicle that ever rolled off the assembly line in Greensburg was the four-cylinder Honda Civic Sedan on October 9, 2008. At the time, 1,000 associates worked at the plant over one shift. Now, Honda Manufacturing of Indiana operates two shifts with more than 2,500 associates producing both the Honda Civic Sedan and the CR-V, two of the company’s best-selling nameplates. It also recently added the all-new 2019 Honda Insight to its production line. Since 2008, HMIN has produced more than 1.8 million vehicles. Production capacity was doubled to 200,000 vehicles per year in October 2011 when a second shift was added, and today the plant can produce 250,000 vehicles annually. During its 10 years of production, HMIN also achieved a number of other milestones, such as earning the Platinum Plant award in the 2011 J.D. Power and Associates Initial Quality Study.